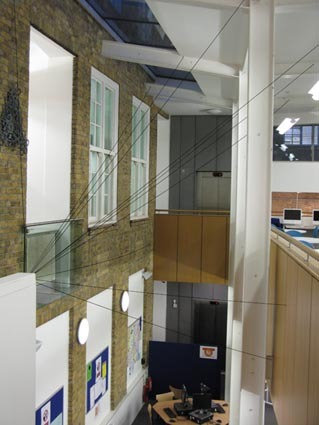 Singularity is a site specific installation commissioned by Ruskin Gallery at the Working Men’s College. 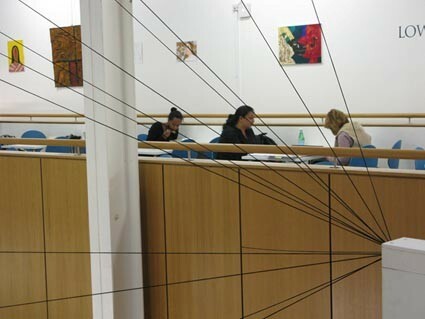 The installation was displayed for two weeks during December 2011. There are many different definitions available for the word singularity. Some can describe technological singularities whilst others establish gravitational, or mathematical singularities. The specific installation attempts to visually describe density singularity, which is usually done by showing a two dimensional plane that has a conical depression, a bit like pressing a finger into a stretched rubber sheet. 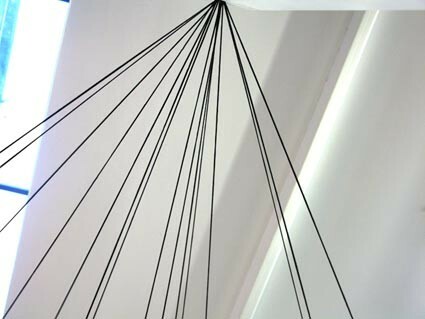 Charalambous had stated that he has always imagined lines coming to or from the single point. Here at the Ruskin Gallery he has translated his scientific endevour into an artistic experience, that is at once as ephemeral and transient as single point of beginning or end. Andy Charalambous is a final year FdA fine art student at the Working Men’s College, as well as being Artist in Residence for the Particle Physics group at University College London. For more information on the artist, please feel free to contact the curator, Erica Shiozaki, or follow the links below.